Well, hello Sunday:) Don’t you just LOVE the sweet weekend morning feeling! My day started with a lazy tea in bed and pinning some gorgeous in season looks. Even though a ‘no-plan’ day seemed blissfully amazing, I eventually decided to get on with an action plan of sorts. Planning and research have been my all-time favorite tasks but I must admit I’m not the most efficient when it comes to execution. So today will be the day to make-it-happen! Read on to find out what inspires me and the weekend style ideas I’m sharing here..
“Pop of leopard look“- Khaki is in-arguably this season’s hottest colour trend and I’m giving you three super easy to put together looks for your Sunday style. Let’s start with an understated knit top paired with white jeans and a hint of rose gold accessories. 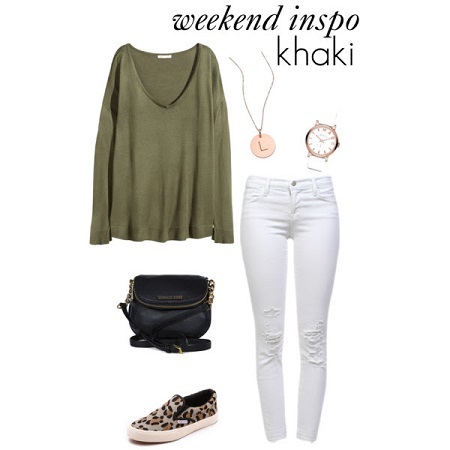 Finish with leopard slip-on sneakers and a classic cross body bag. 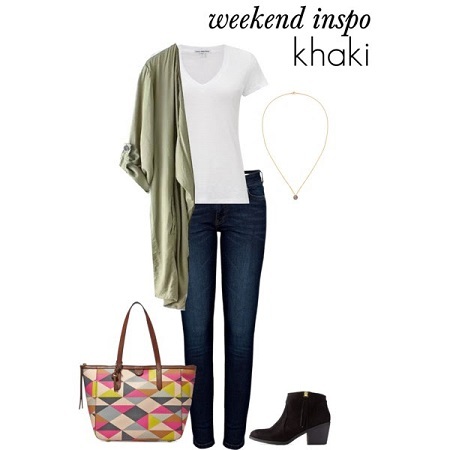 Simple, stylish and perfect for your Sunday shopping escapade and right on the mark for a transeasonal outfit. “Sporty chic” – A black sweater is a winter must-have for every wardrobe.. for obvious reasons! In this look I’ve teamed the sweater with a pair of well fitted khaki jeggings for your Sunday walk. A variation to your trackies and workout gear. A snood will protect you from the chill and will make a cute addition if you decide to dress for a casual coffee catch up instead. 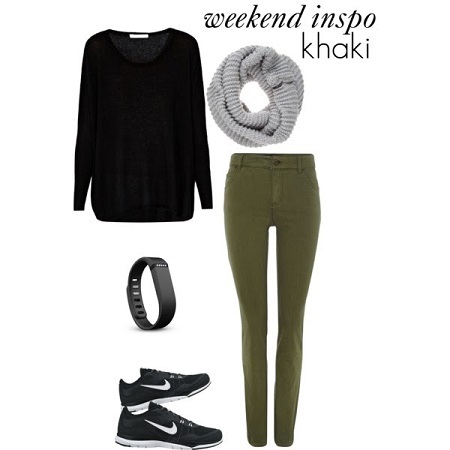 Your fitbit also fits in as the perfect accessory in this sporty chic ensemble. Like? “The soft trench look” – And here’s a look that marries two gorgeous trends ..the soft trench and khaki! Just use the evergreen white tee with jeans base and add this flowing trench combined with your favourite black ankle boot and a pretty printed tote to go..
Love the looks? I would love to see how you wear them, email me your pictures at klasstyle@gmail.com OR tag me @klassystylefiles if you share your outfit pictures via Instagram. I really like this article and your blog in general! The outfits you offer look very aligned with the taste of women for their everyday life.